Description: Compared the differences of heart rate variability parameters in the groups of surviving patients and those who died during a 1 year after development of acute myocardial infarction. The best prognostic properties revealed for the coefficients of wavelet decomposition of the RR intervals time series on frequency proper to 32 cardiac abbreviations at the separation on 1024 RR fragments with averaging for 2-4 hours. The features of the physiological data processing taking into account influencing of circadian rhythm have been discussed. Oparin, A.L., Rudyk, Iu.S. and Ovcharenko, I.E. 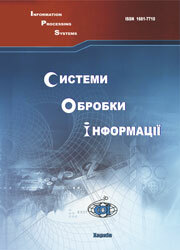 (2007), “Sravnenie prognosticheskikh svoistv pokazatelei variabelnosti serdechnogo ritma u patsientov posle ostrogo infarkta miokarda”, Information Processing Systems, Vol. 6(64), pp. 80-81.